We’d love your help. 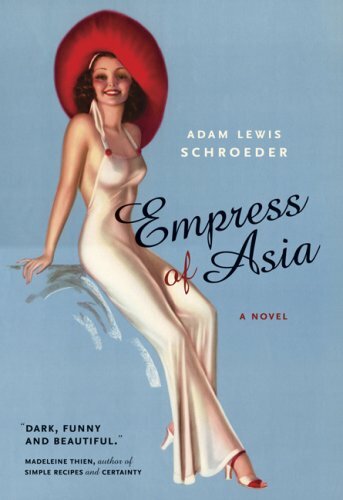 Let us know what’s wrong with this preview of Empress of Asia by Adam Lewis Schroeder. To ask other readers questions about Empress of Asia, please sign up. For a debut novel, this book is a big challenge for Adam Lewis Schroeder to have taken on. Told in three parts, the story begins in Vancouver in 1995, ends in Thailand, again in 1995, with the majority of the middle set during WWII in the Malay Peninsula. At first, I thought this story was going to be set in the Kanchaburi Province in Thailand, which interests me personally, and be more a love story than a war story. Why? Because in Part 1 (31 pages) elderly Lily, stricken with pneumonia, informs Harry that his war buddy Michel Ney is still alive, living in Thailand. This is not the only shock she delivers to her decades-long husband: every time Harry thought Lily had been going to Singapore to see “Pia”, she’d actually been visiting Michel, the man who had saved Harry’s life so long ago. Harry must go see him. Lily gives Harry the address she had managed to write down, and then she dies. Part 1 ends with Harry booking a flight to Bangkok, and being told that it isn’t going to be easy to get to his destination. Cut to Part 2, which goes on for 336 pages, where we are briefly taken back to Singapore in pre-WWII, where young Harry as a Canadian Marine meets Lily after the bombing of his ship, The Empress of Asia. They quickly fall in love and marry, only to be separated shortly thereafter. And so begins the major part of the book, with Harry in the midst of the turmoil of the Second World War, fighting in one of the first battles with the Japanese, then captured and subsequently surviving as a Prisoner of War. The thread that holds the narrative together is Harry “talking with” Lily during their long separation, although this thread was often stretched thin. This is not to say that this part of the story was not well-written, with wonderful, at times poetic, prose. In Part 3 (42 pages), in Thailand, Harry learns Lily’s secret, summing the book up as a story mainly about war, but also about love and loss, devotion and duplicity. Schroeder’s description of the Malay Peninsula and life in a Japanese POW camp makes for interesting reading. If you enjoy accounts of the Second World War, then I would recommend this book. had some very good moments, especially the ending. I liked how it showed the chaos in Sinapore when the Japanese captured the city. The dialoge I thought was poorly written, and the writer used dialoge to move the story along. So it was very hard to understand what was going on. This is a good story but difficult to follow in the middle part...too bad as this is the core of the story. I found myself speed reading. the final third part was mych better...enjoyed the ending. Wished i had more compassion for Harry. The Empress of Asia opens as Harry Winslow's dying wife tells him that Michel Ney, a WWII buddy, is still alive and that Harry must go to Thailand and see him. This begins Harry's quest to a remote area of Thailand to reconnect with his past ... or so he thinks. Harry Winslow is a wild youth with a love for Fats Waller music and an itch to see the world. Harry joins the merchant marine and finds himself on a ship called the Empress of Asia. The Empress is sunk by the Japanese, near Singapore, and The Empress of Asia opens as Harry Winslow's dying wife tells him that Michel Ney, a WWII buddy, is still alive and that Harry must go to Thailand and see him. This begins Harry's quest to a remote area of Thailand to reconnect with his past ... or so he thinks. Harry Winslow is a wild youth with a love for Fats Waller music and an itch to see the world. Harry joins the merchant marine and finds himself on a ship called the Empress of Asia. The Empress is sunk by the Japanese, near Singapore, and Harry is transported to the island where he wanders, unsure what to do next. During his brief time in Singapore, Harry meets and marries Lily. Married for only one night, the couple is separated and find themselves in POW camps on different islands. Neither Harry nor Lily know whether the other is alive until, years later, Harry is brought back to Singapore and placed in a POW camp just a few short miles from Lily. The POWs are liberated by Allied troops and Harry and Lily are reunited. What Harry doesn't know, is that Lily carries a painful secret during the length of their married life. It is upon her deathbed that she gives her husband the cryptic message that he must go to Thailand to see Michel. I thought I was reading a love story when I began this book and was quite surprised to find myself reading an adventure story instead. Harry Winslow survives jailbreaks, horrendous conditions in POW camps, and dangerous sea crossings. What is missing from the majority of the book is a sense of Harry himself. Harry seems oddly removed from his horrendous circumstances and shows little ambition to try and change them. Instead, he is malleable to the whims and plans of others. Michel Ney is a loyal friend and Harry owes much of his survival to this man; yet when Harry discovers just how much Michel has done for him, he is as reflective and emotional as a doorknob. Because of this, I found it hard to connect with either Harry or his plight. "... the snakes just slither around in the bottom but ... the turtles are stacked one on top of the other and in the fifteen seconds that I'm watching one of them drags himself to the top and flips onto the pavement! ... Gumboot plunks him back in. ... [T:]he next turtle takes his turn over the side. And if they're all going to end up in the soup anyway, why should the ones on the bottom give two shakes if the ones on top have a little more ambition? In the meantime the snakes just lay there wondering which minute is going to be their last, so which bowl would you rather have been in?" Harry realized in that instant that he had lived his life as one of the snakes. He looks forward to discussing this with Michel over beer. Harry's challenge is to move beyond mere survival and go forward with the life he has rather than the life he imagined was his. He has lived a shuttered existence since his liberation and neither traveled great distances nor resolved his distrust of the Japanese. The beautiful ending of the Empress of Asia opens Harry to the greater world and to the love of others. An elderly man, seventy-something, visits his dying wife in the hospital and on her deathbed she gives him a cryptic message that sends him back to Singapore, where they both were Japanese POWs. Then the action transfers to 1940 when our narrator is a young man and joins the merchant navy. Thus begins an epic story that spans from 1940 until the present, through Canada, Singapore and Indonesia. A fascinating insight into one man's war, a war that shaped the person he would become for the rest of An elderly man, seventy-something, visits his dying wife in the hospital and on her deathbed she gives him a cryptic message that sends him back to Singapore, where they both were Japanese POWs. Then the action transfers to 1940 when our narrator is a young man and joins the merchant navy. Thus begins an epic story that spans from 1940 until the present, through Canada, Singapore and Indonesia. A fascinating insight into one man's war, a war that shaped the person he would become for the rest of his life. The book is written in the first person, but as the narrator is writing to his dead wife it occasionally slips into the second person which at first is a bit difficult to read but becomes less noticeable as the reader becomes familiar with the narrative. My main problem with the book is that there are no chapters, instead the book is divided into three parts, with Part 2 being the majority of the book. This made the book feel overly long to me, a problem I think would be easily solved with chapter breaks. The narrator is very well-written, a believable character and a true product of his time. I hesitate to throw names around, yet I felt a distinctive Atwood resonance, but from a male perspective, to the book. This has been my surprise novel of the year so far. I picked it up in the discount section of our local bookstore for $4.99 for a trade paperback. Knowing nothing about the book or its author, Adam Lewis Schroeder, I was pleasantly surprised by the quality of his writing and how well he developed his characters. The story opens in present day with Harry Winslow visiting his sick and dying wife, Lily, in the hospital. Lily reveals a secret just before she dies, thus setting Harry on a long journe This has been my surprise novel of the year so far. I picked it up in the discount section of our local bookstore for $4.99 for a trade paperback. Knowing nothing about the book or its author, Adam Lewis Schroeder, I was pleasantly surprised by the quality of his writing and how well he developed his characters. The story opens in present day with Harry Winslow visiting his sick and dying wife, Lily, in the hospital. Lily reveals a secret just before she dies, thus setting Harry on a long journey that takes him around the world to Thailand. We are then transported back to Harry's youth. As a young Canadian marine, Harry gains employment on a old ship called the Empress of Asia. His travels eventually lead him to Singapore during the Japanese occupation in World War II. It's there that he meets a young British woman named Lily. The two fall in love and get married, only to be separated when they are trying to leave Singapore during an air raid. The rest of the story tells of Harry's search for his wife across the Dutch East Indies, and Lily's final revelation. Schroeder colours this adventure of searching for his accidentally separated wife during WW2 with relentless sensory detail, particularly of the horrors of war. That main section of the novel is bracketed with the present times and looks at the nature of secretiveness. It is the story of a survivor. I found it a bit of a challenge to keep track of all the characters, but they are done with creatively unique voices. A gripping and funny WWII novel. There are about forty sloppy, loose pages toward the end, but otherwise, Schroeder is totally in control. There's seagull-eating, hasty marrying, ship-sinking, Fats Waller-adoring, and secret-keeping, all narrated in a charming, funny, and unsentimental first-person voice. A good read but thin on emotion. There's no fear or love in tragic and very dangerous circumstances. But I still enjoyed the overall story. With more emotion I really think it could have been a sweeping epic. tenderness, humor and irony in a story of love and war. The central hero is trying to survive despite the adverse and inhuman conditions. Relationships changing roles, the connection of friendship and betrayal. While I liked the story-within-a-story structure and enjoyed the voice of the 70-something ex-seaman protagonist, ultimately I thought the payoff was too small for such a detailed account of madcap adventures during WWII. It was a fast read - lots of adventure. What can I say? It made me cry. A beautiful, improbable love story wrapped around a tale of adventure and survival during world war 2. Vivid characters, amazing plot, great historical and geographic setting -- but the action dragged at some points due in part to confusing dialogue. It took a while to get into this book and get used to the quirky hero, but persistence paid off with a great love story set during WWII in Singapore. The first few pages and last few pages were great. The entire middle of the book was a complete yawner! This was on my to find list for a long time. When I found it on a clearance table I was thrilled. It never lived up to it's review but it was stil an ok read.